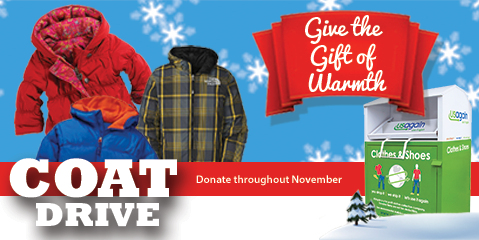 Nov. 1, 2014 – USAgain, the textile recycling company specializing in providing consumers with a convenient and eco-friendly option to rid themselves of excess clothing, announces its third annual national coat drive that provides local Boys & Girls Clubs with donated winter clothing during the holiday season. Items may be deposited into USAgain bins throughout the month of November. USAgain will collect warm clothes, including coats, hats, gloves and mittens to make a donation to local Boys & Girls Club organizations during the second week of December. Clothing assembled at each USAgain collection site will be directed to a local Boys & Girls Club, which will then donate the clothing to a family in need. The clothing drive provides a convenient, accessible way for people to donate locally during the season of giving. Donated coats may be slightly worn but still in good enough condition to be worn again. The campaign is running nationally in 10 cities where USAgain divisions are located: Atlanta, Chicago, Denver, Milwaukee, Minneapolis, New York, Pennsylvania, St. Louis, San Francisco and Seattle. To find a USAgain recycling bin to drop off winter clothing, simply visit www.usagain.com/find-a-collection-bin and enter your city or ZIP code. All styles and sizes are accepted and should be placed in a bag before being placed in the bin. Details here!